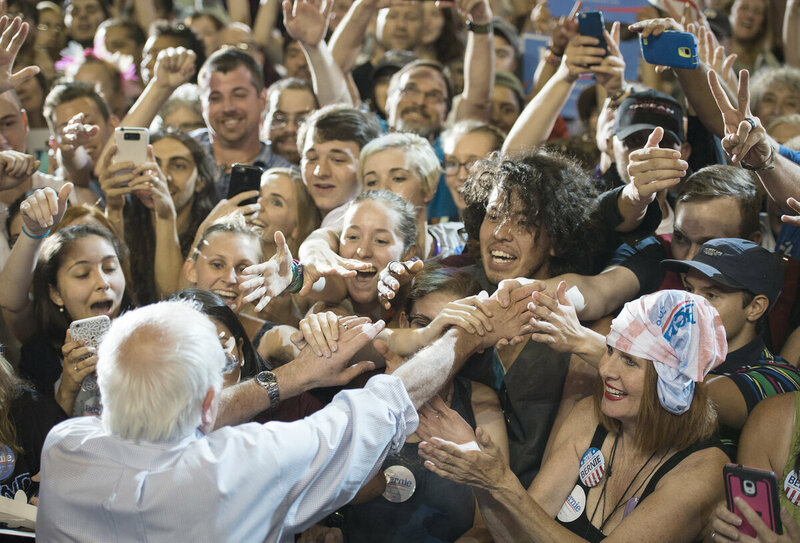 Bernie Sanders And The Size And Wisdom Of Crowds : It's All Politics The wisdom of the crowd is at the heart of the democratic ideal. Someone is saying something others want to hear. But if you've looked at crowds from both sides, you know they can also be misleading. Sen. Bernie Sanders, I-Vt., has gotten some of the biggest and most devoted crowds of the 2016 presidential race, including in Portland, Ore., this month, where he drew more than 19,000. One measure of how impressive Bernie Sanders' crowds have been lately is the respect they get from Donald Trump, a man who clearly believes size matters. "He's getting the biggest crowds, and I'm getting the biggest crowds," Trump said last week of Sanders in one of his innumerable TV interviews. He meant it as a putdown of Hillary Clinton, but the left-handed salute to Sanders resonated. Because he has arguably drawn the very biggest crowds this summer, even more "biggest" than Trump's. Over the weekend, when both men stumped across Iowa, rampant controversy raged across websites about their respective audiences. Trump insisted his crowds at the State Fair were the largest for any candidate. Sanders' supporters upheld their claim to the same distinction. More objective observers tended to side with Sanders, while also noting that Trump's throngs were at least partially drawn to his helicopter, in which he gave rides to children, among others. Sanders himself mocked this competition as he mounted the State Fair's famed Soapbox stage on Saturday. "We left the helicopter at home," he said, to knowing laughs from the crowd. Trump touts his crowds as a measure of his importance and legitimacy. He often refers to his hearers in multitudinous terms, suggesting that people's mere presence at his events confirms the truth of everything he says. He backs this up with references to "every poll, every single poll" as a broader data point. But what really energizes The Donald is what he gets back from his crowds. About a decade ago, financial reporter James Surowiecki wrote a much debated book called The Wisdom of Crowds. He notes that large, loose and spontaneous aggregations of people have had a bad reputation ("mob psychology") but can also be sources of insight and good judgment. He argued that "collective intelligence" could be superior to the more conventional wisdom of experts and other elites. Professionals in marketing, for example, need to be aware of how groups of people who do not know each other, or share any other characteristic, act in unknowing concert in reacting to a specific product or service. There can be positive or negative social reaction to a given restaurant, for instance, even before it is reviewed. And that reaction may be more reliable than the review. This approach to business and economic problems may ruffle the feathers of those who rely on theories and data. And when applied to politics, it makes longtime observers frown. On the positive side, the wisdom of the crowd is at the heart of the democratic ideal. Someone is saying something others want to hear. But if you've looked at crowds from both sides, you know they can also be misleading. In the final weeks of a presidential campaign, for example, the candidate who is trailing sometimes draws bigger crowds than ever. That was true with John McCain and Sarah Palin for the stretch run in 2008, when his audiences were not only numerous but on the brink of frenzy. It did not help McCain. Longtime political reporters can tell you about big crowds for Michael Dukakis in the fall of 1988, or Walter Mondale in 1984 — even George McGovern in 1972. All were about to get their ears pinned back — they carried an average of four states each. Yet their late rallies were teeming with wildly enthusiastic supporters by the tens of thousands. Something similar was seen in the 1980s when Jesse Jackson drew overflow crowds in many parts of the country but did not come close to challenging for the Democratic nomination in either of his bids. And in 2004, former Vermont Gov. Howard Dean was not only getting big crowds but also exploring an uncharted sea of support on the Internet. Yet Dean's ship ran aground in Iowa, the first voting event of the year. On the other hand, the crowds that began to show up for the campaign events of candidate Barack Obama late in 2007 were unusually large and even reverent. And they did turn out to be harbingers of far larger, historic throngs that would appear for him in 2008. Obama's ability to enthrall vast audiences was an important ingredient, if not the key ingredient, in his phenomenal rise. So does the size of early crowds matter where late campaign surges do not? If so, Sanders, and Trump, too, can take some satisfaction in their success. On the other hand, while the campaign's early stage makes these crowds impressive, it also leaves open the possibility the crowds will dissipate — or prove less meaningful in the long run than they had appeared. In his book, Surowiecki allowed that crowds can fail in their judgment. The first criterion he offered to test a given crowd's wisdom was diversity of viewpoint. Are a lot of different people all heading in the same direction all of a sudden? That is likely to be a crowd worth following. Beyond that, he posed other questions. Are the members of a crowd coming to a shared interest on the basis of information they gathered on their own? Or was it planted in some organized, perhaps insidious way? Had they reached some common conclusion before they began influencing each other? The final test of a wise crowd is to make a difference. It needs to translate the personal judgments of its constituents into a collective decision that leads to some action or effect. One such effect might be to elevate a relative outsider to the nomination of a major American political party. Or even to real contention for that prize. So, keep an eye on these crowds, and keep counting noses.